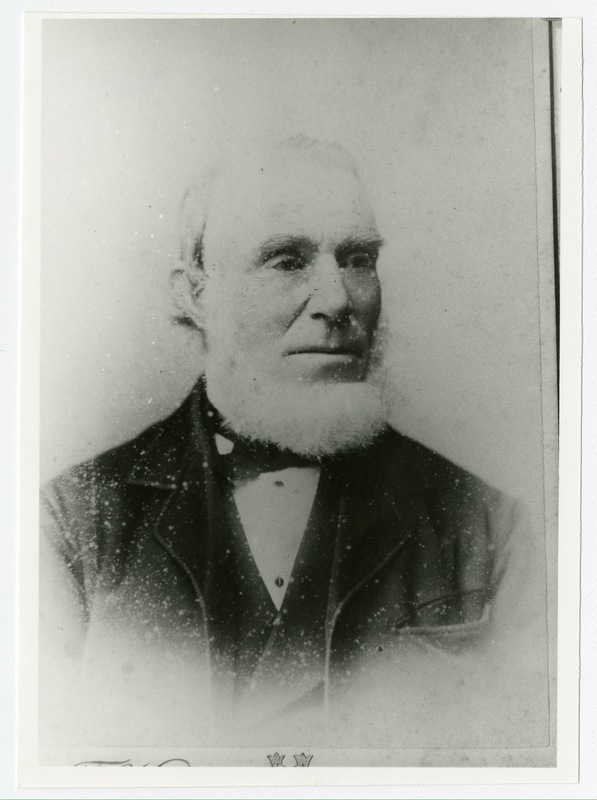 Born in Cornwall, Captain Matthew Grose (1819-1887) was a renowned Mining Engineer in the Isle of Man. He managed Ballacorkish Mines on the island and also inspected many others, too numerous to cover in one post. He was a mining man through and through. 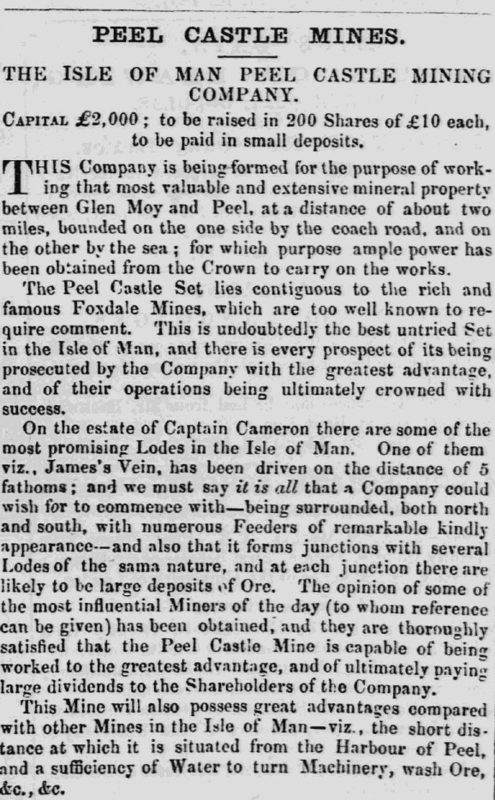 His father, also called Matthew Grose (1788 – 1849), born in Loxton, Somerset, was a Mine Agent who worked in Cornwall, then at Foxdale Mines, Isle of Man from 1828-1846, before opening a ‘fine granite quarry’. His grandfather, another Matthew Grose (1761 – 1824) and great uncle, Samuel Grose (1764 – 1825) were Cornish Mine Captains born in Redruth, who worked at mines in Cornwall and Somerset. More information about his family can be found here. 1819 Matthew was baptised at Phillack, Cornwall on 19th March, 1819. 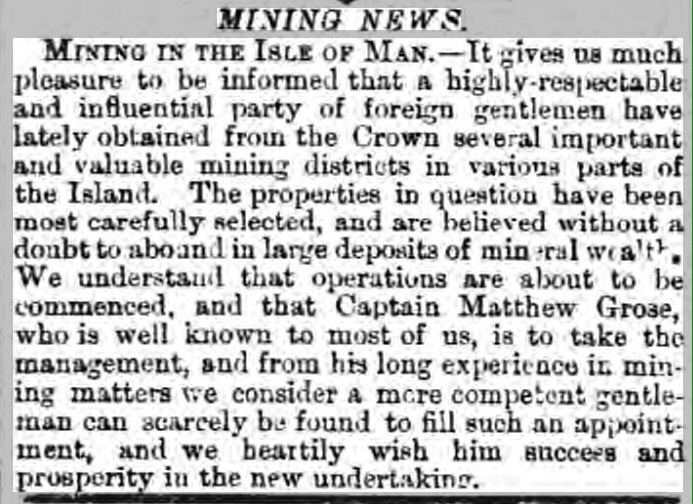 1828: At the age of nine, Matthew moved to the Isle of Man where his father becomes a Mine Agent at Foxdale Mines. 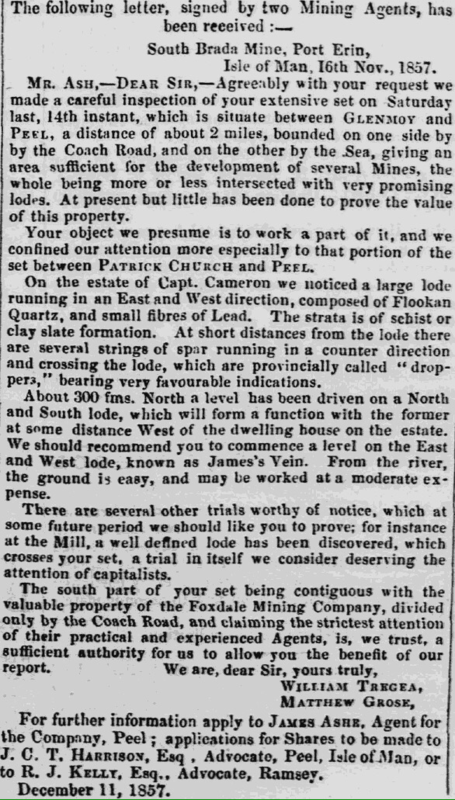 1841: The census shows Matthew is living and working at Foxdale Mines with his father who is the Mine Agent there. Matthew is working as a miner and his brothers, Thomas and John are engineers. Later that year he married Anne Weston Read. 1846: Slater’s Directory (Douglas) lists Captain Mathew Grose as the Agent to the Foxdale Mining Co. Adress given as Moore’s court, Market place. This is his father, but undoubtably both were still working closely. This is the year his father was dramatically dismissed from Foxdale Mines. The Crown Agent, John Taylor, then stepped in and gave him setts of land & he opened a fine granite quarry. 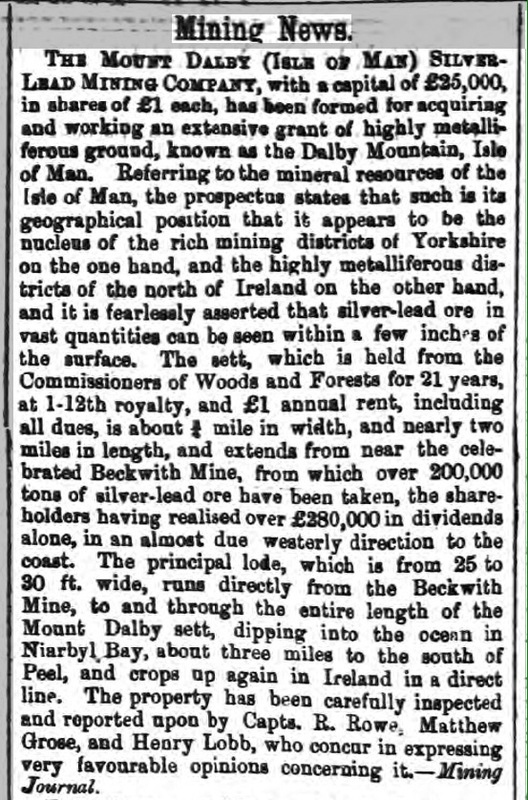 1846-1851: At some point adventuring, exploration and lead mining begins at Ballacorkish (Rushen Mines) on the hillside above Colby. 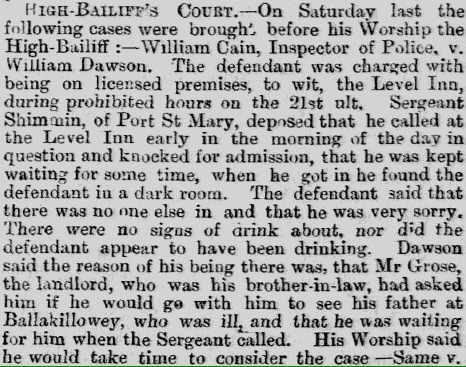 1851: The census shows Matthew Grose residing at Ballagawne in Rushen with wife, Annie, four of his children and a house servant. His occupation is given as Agent of Mines. 1852: The Brig Lily is shipwrecked on the islet of Kitterland. The following morning a salvage team go to save the cargo, but the gunpowder aboard explodes. Miners at Ballacorkish have their candles go out and are thrown over by the force of the explosion. 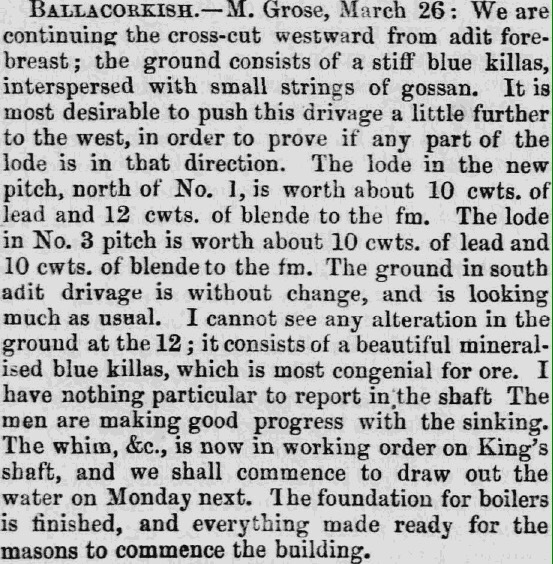 1855: Limited lead mining operations are still ongoing at Ballacorkish. 1861: The census shows Matthew Grose residing at Ballacorkish in Rushen with wife, Annie, eight of his children and a house servant. His occupation is given as Lead and Copper Mine Agent. Work resumed when the mines were reopened in 1862 and developed on two lodes. Two shafts had been sunk 600 yards apart and the sett was worked as two separate mines which were known simply as North and South with no connections being made underground. 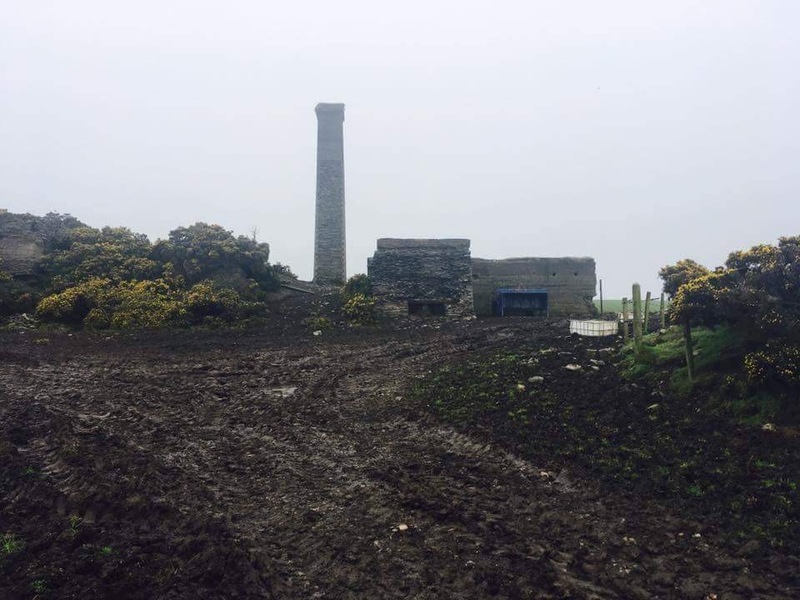 The North, or Phosphate shaft (Rushen mine) was sunk to a depth of 360 feet (60 fathoms) with levels at 15, 30, 45 and 60 fathoms. The bottom levels were driven for 180 feet south and 780 feet north. The South shaft (Ballacorkish) was sunk to a depth of 450 feet (75 fathoms) with levels driven at 12, 24, 36, 60 and the bottom at 75 fathoms which had been driven to a length of 390 feet south and 1470 feet north. 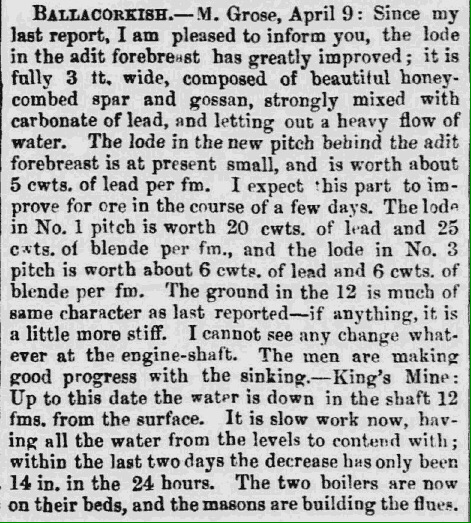 Both mines had to pump water out at the rate of about thirty gallons per minute but an adit level driven from the main road also helped to drain the mine and reduce the pumping cost. 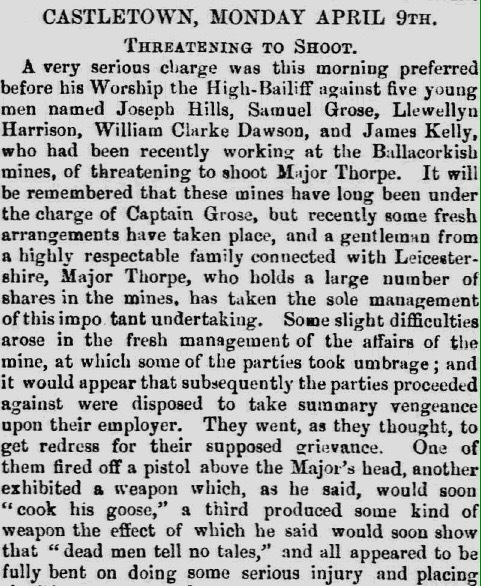 1863: Thwaites Directory (Rushen) lists Captain Matthew Grose as the manager of South Foxdale Mines (Ballacorkish). 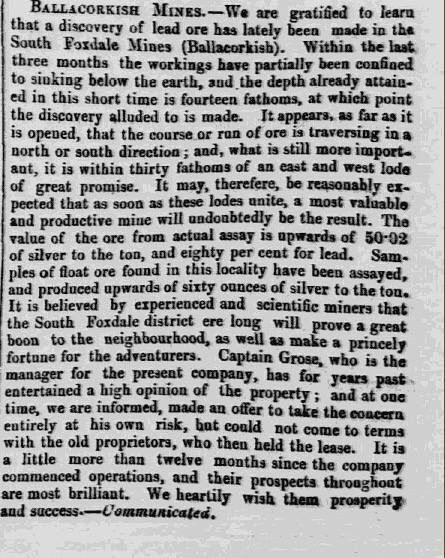 The South Foxdale Silver-Lead Mining Company have recently been established for the working of a set of mines lying south of the Foxdale mines. The set includes the Ballacorkish Mine and is upwards of four miles in extent. The capital of the company is £25,000 raised in shares of £6 each. The works comprise an edit level driven about 300 fathoms, which has yielded a considerable quantity of lead ore and blonde. About 200 fathoms from the entrance is a large east and west lode, from which, within a very small space, a cargo of rich silver ore was raised. About 80 fathoms in advance of this edit, two shafts have been sunk about 20 fathoms deep, and several parcels of ore raised; and a few fathoms from the present end of edit, several lumps of ore near the surface have been found in an east and west direction, yielding from 60 to 60 ounces of silver to the ton of ore.
1863: Matthew is involved with other mining operations on the island. 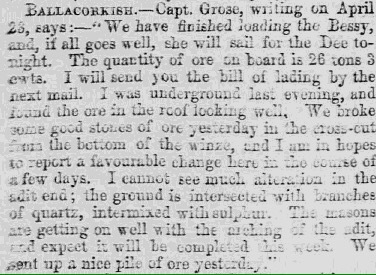 1868: Mining operations are going well at Ballacorkish. His wife Anne died in May 1868. He takes out a notice in the newspaper to state that he won’t be responsible for debts contracted by others. In September 1868 he marries his second wife, a widow, Elizabeth Luff (nee Qualtrough). 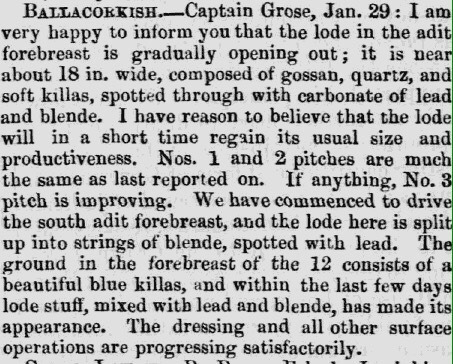 1870: Matthew issues several reports on progress at Ballacorkish. 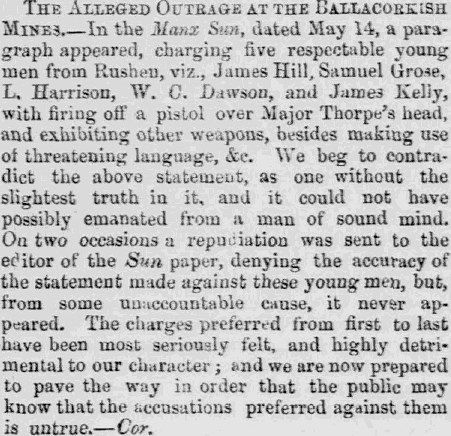 The ‘slight difficulties’ being that Major Thorpe made allegations that five young men (including some relatives of Captain Grose) had threatened to “Cook his Goose” and shoot him! But was it fake news? 1871: The England census shows Matthew Grose (Mine Agent) with his second wife Elizabeth (nee Qualtrough). He is in Pontesbury, Shropshire, England visiting his older sister Emma Harrison (nee Grose) who is wife of Jonathan Harrison (Mine Agent). He is also on the 1871 Isle of Man census at Ballakilpatrick road, Rushen with occupation given as Agent Lead Mines. 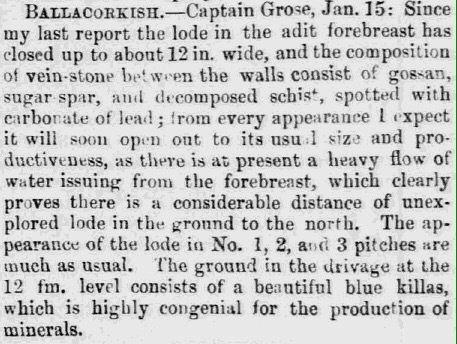 1872: Matthew Grose inspects a mine at Dalby, Isle of Man. 1875: Matthew Grose is appointed manager again. 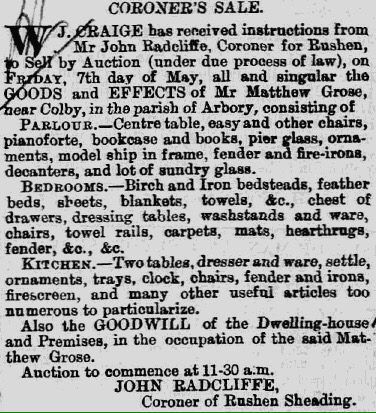 1880: Matthew seems to be in some financial difficulties with his goods and effects being sold off. 1881: The census shows him at The Level, Rushen with wife and children. He is Captain of Lead Mines, unemployed. 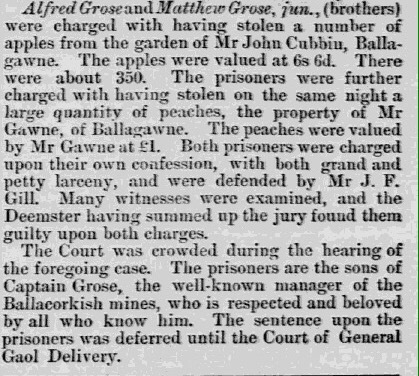 1886: Matthew Grose is ill and residing at Ballakillowey. 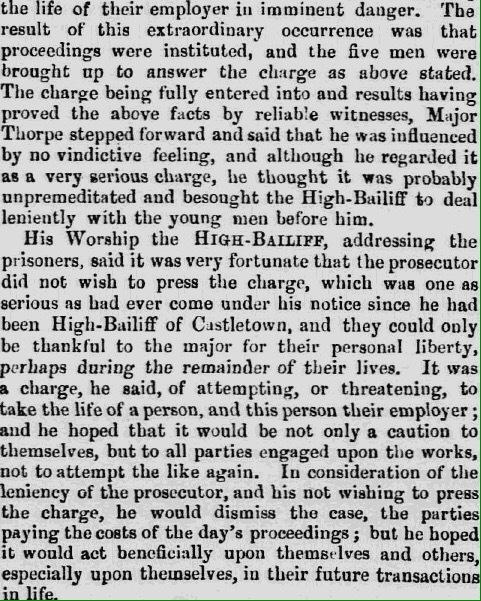 1887: Matthew passes away at Ballavayre (or Beal-e-Vere in the newspaper). These are just a handful of the references to Matthew Grose’s long mining career on the Isle of Man. In future posts, specific aspects might be revisited and discussed in more detail. Also thanks to fellow researcher, Rob Cannell – between us we’ve found plenty of newspaper clippings! You’re welcome. Thanks for reading. Many thanks for the details about location of Ballakillowey. That’s really interesting & useful to help understand it’s position in relation to the mine.